When Level-5 CEO Akihiro Hino created Professor Herschel Layton, he drew inspiration from Capcom’s Phoenix Wright; now, the proper English puzzle master and the comeback kid of the courtroom have come together in Professor Layton vs. Phoenix Wright: Ace Attorney. Both series are right at home using a mixture of visual-novel-style narration along with thought-provoking gameplay, though they come at it from slightly different angles. So, how do things turn out when Capcom and Level-5 bring these iconic characters together? The game opens in London, where Professor Layton and his assistant Luke meet up with a young woman named Espella. They share a mutual friend named Carmine, who sent Espella to the Professor’s home for protection. When Espella is captured, she leaves behind a book called the Historia Labyrinthia, which transports Layton and Luke to Labyrinthia, a setting that looks like something out of a fantasy novel. Shortly after, Phoenix Wright and his assistant Maya Fey arrive in London as part of a cultural-exchange program between England and the Japanized America that Ace Attorney takes place in (in the English translations, at least). Upon arrival, Phoenix gets pulled into court to defend a young woman who looks like Espella, though her demeanor is a bit different. After the trial, the two happen upon a copy of the book and end up transported to Labyrinthia, as well. Labyrinthia looks like what one would expect from a fantasy castle-town in the feudal era, filled with street markets, armor-clad knights, and bards singing for their supper. Except, instead of a king, the town is run by The Storyteller, a mysterious figure who seems to be able to predict, or dictate, the future. He throws parades on a regular basis where he gives out copies of the next part of the town’s “story,” and the events always seem to come true. As the protagonists arrive, the town is in the midst of a series of witch trials. The locals are searching for the Great Witch Bezella who long ago destroyed the town in a fire. She also grants powers to other witches in town, and the citizens are out to capture all of the witches they can and put them on trial in hopes of learning who Bezella really is. However, not all is as it seems, and Layton, Luke, Phoenix and Maya must all try to get to the bottom of Labyrinthia’s secrets. While many of the story’s turns are predictable if you’ve played Professor Layton or Ace Attorney games before, this one has a darker tone than most of those games, so you might not guess everything. And if you’re wondering why it’s Professor Layton versus Phoenix Wright? There’s a reason for that, too. Outside of the main quartet, there are a few, brief cameos from other known characters, but most of the game is populated by the denizens of Labyrinthia. Virtually all of them have some sort of quirk, as characters do in these series, though some are more annoying than others–I’m looking at you, letter-carrier and your grating, high-pitched yell. While a couple of these characters play major roles in the story, most of them are throw-away characters, so there’s little attempt to make connections with the player. The ones that they do spend time on though, are pretty well fleshed out and interesting, at least. 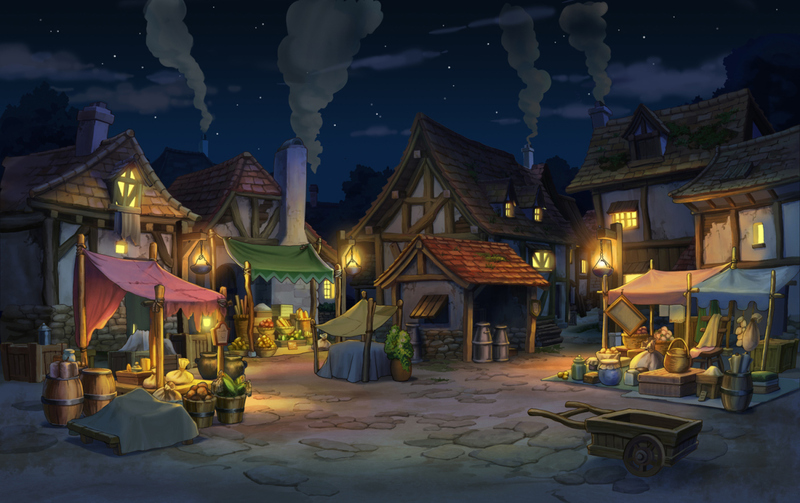 As the mysteries unravel, the story delves into the pasts of several key characters such as Espella and The Storyteller and their connections with each other, the town, and other major players in Labyrinthia. Just as The Storyteller might approach things, PL vs. PW:AA is divided into chapters, and alternates between Layton-style searching and puzzle-solving chapters and Ace Attorney-like courtroom battles. 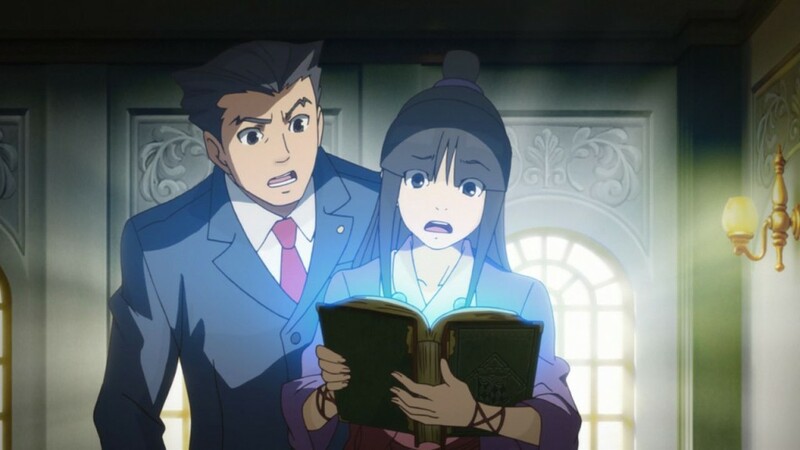 While crime scene investigation and interviewing have played a pivotal role in the Ace Attorney series, they are traded for Layton‘s puzzles. This makes the game feel a little disjointed, as the two systems don’t quite mesh the same way. As the game goes on, the characters will mix and match back and forth, so Maya will help with some puzzles or Professor Layton will assist in the courtroom, so it’s not as if the two are completely separate entities. The puzzle chapters feel like they are pulled straight out of Layton, as you poke around the streets, talking to people who give you puzzles and collecting hidden hint coins. If you find even most of the hidden coins, you’ll end up with more than you could ever hope to use, so you don’t have to worry about saving them all if you’re really stuck on a puzzle, but they can also be used in court, as well. That being said, most of the puzzles felt like they were on the easy side for a Layton game, so don’t be surprised at how few coins you might need to look for in the first place. The courtroom scenes take place in Labyrinthia’s Witch Court, and it is Phoenix’s job to defend the accused. 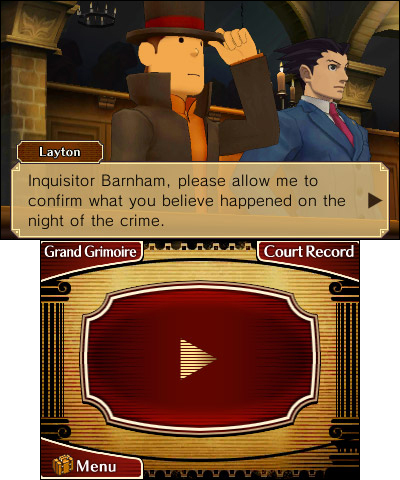 The basics of gameplay are all there, with pressing witnesses and presenting evidence, though most of the evidence you’ll use is presented by the prosecution (called “The Inquisition”) during trial, as there are few times where you get to investigate much of anything at all during the puzzle sequences. Phoenix doesn’t seem to have his Magatama on him in this game either, which means no psyche-locks to break. Instead, the courtroom gimmick of choice is a simplified version of Apollo Justice’s “Perceive” ability, where he can detect reactions and nervous tics in court. Since Labyrinthia is only interested in railroading these witches during trial, they put all of their witnesses on the stand at once to speed up the process, but Phoenix can analyze the reactions of all the other witnesses while one is talking. If they seem to disagree with a statement, they will react, and Phoenix can cross-examine the second witness. Given the lack of forensics and investigation, you’ll spend most of your court time looking for these triggers to get anywhere. If you do find yourself stuck, you can use your saved hint coins during trial. Unfortunately, this makes situations even the hard situations extremely easy at times, as a single coin will tell you which statement to press or present evidence on. 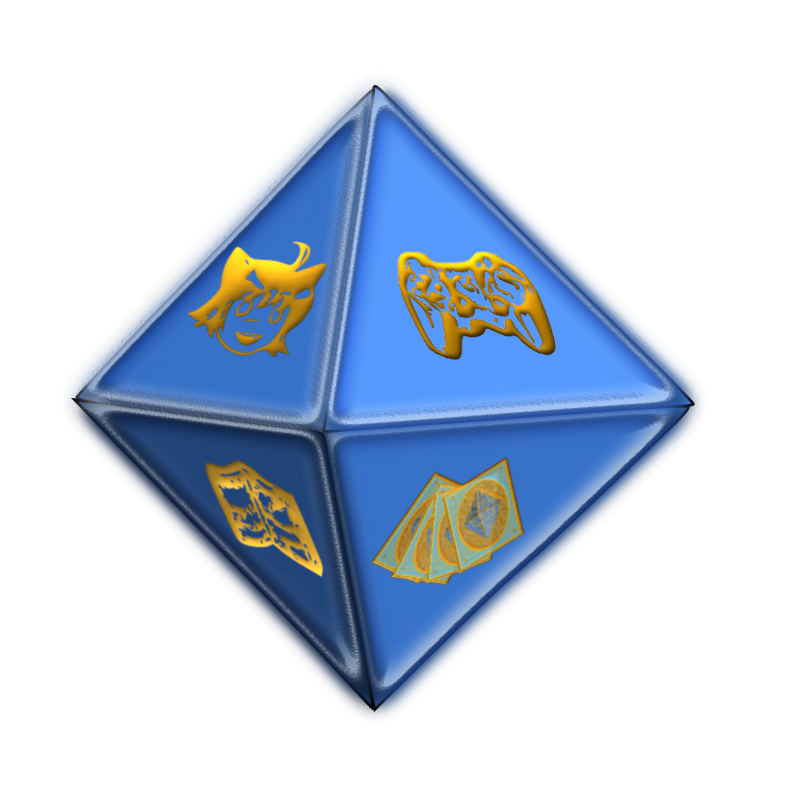 In addition, that same coin will narrow down the dialogue choices after you press or halve the number of items to choose from if you’re presenting a contradiction. The cost of a single coin makes this a broken function; something that powerful needed to cost much more to maintain balance. Solving puzzles and successfully defending your charges will reward you with Picarats, Layton‘s version of points, which will help you unlock bonus content after beating the roughly 20-hour game. The unlockables include a gallery with the still-frames and backdrops from the game, a movie viewer for the animated sequences, plus audio libraries for background music and some voice clips. After beating the game, you can also access extra downloadable content that takes place post-game, where Phoenix and Maya return to England to see Luke, Layton and other characters from the game. These mini-episodes are light-hearted with people frequently breaking both character and the fourth wall, and they also include a few extra puzzles. Graphically, the game mixes the traditional character designs from both series, meaning that looking at Layton and Phoenix stand next to each other is a little jarring at times. The professor’s beady eyes and Lego-minifig-shaped head don’t mesh with Phoenix’s slicked-back hair and more traditional facial features. It looks as though the designers wanted to bridge the gap with the characters they encounter, and it leads to some of them, including Espella, looking like they belong in a Fire Emblem game, rather than either of the two series proper. The backgrounds are beautifully detailed, as are the few still-frame illustrations used during narration. There are also a number of animated scenes, which look nice on the 3DS screen and are worth revisiting in the post-game extras to enjoy them again. The only real graphical issue I ran into was that there were times where it seemed like the character models would lag slightly during certain sequences, which did break the immersion a little. Like the graphics, the soundtrack is a mixture of both series and some new ones, as well. Tomohito Nishiura has a knack for creating songs that almost seem like they were adapted from a music box, which is a feeling I’ve gotten before from pieces in Layton games. He worked with Yasumasa Kitagawa to arrange all the pieces for the gameplay sections. For the animated scenes, Nishiura used more orchestrally-scored pieces, creating an epic feel as the sequences played out. The game features several hours of different tracks, so you’ll never get sick of the songs, since they’re great and you won’t hear most of them that often. Overall, Professor Layton vs. Phoenix Wright: Ace Attorney is a good Layton game and a solid Ace Attorney title. It’s not the best of either series, but it brings something new to fans of one or the other. It has a good story and a great soundtrack with some fun gameplay mixed in. It’s not perfect, but I have no objections.